H&M Beauty, we’ve been expecting you. For years you’ve teased us with those limited-edition make-up collections (remember the Lanvin lipsticks?) and a smattering of own label cosmetics. So lo and behold a beauty collection has been announced this morning. The new collection will hit H&M counters this autumn in 900 stores around the world, with over 700 make-up products alone. This is a mass production if ever we saw one. 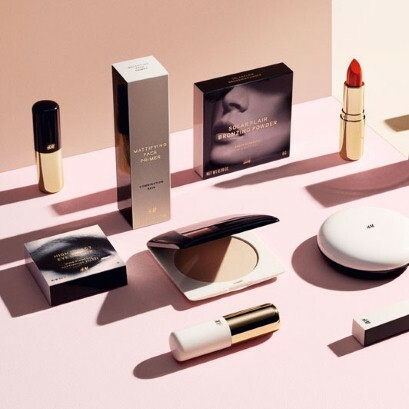 The Swedish fashion brand has gone all out by launching with a complete skincare, bodycare, hair styling and make-up range. On its beauty brief, H&M reveals that fashion is at the heart of H&M Beauty; just as its clothes are inspired by seasonal trends and colours, so too will the make-up, ‘with seasonal drops of new and limited edition colour palettes throughout the year,’ says the brand. Replacing the existing beauty products (nice, but not great), H&M Beauty will also include two subsidiary collections: a premium beauty line and a conscious range of Ecocert-approved sustainable products. Taking it back to the good old fashioned touchy-feely beauty school too, H&M has decided to stock its new beauty collection in dedicated in-store areas, as well as online at H&M.com, ‘for customers to experiment with the latest make-up trends and develop a personal and unique look,’ it says. We hear that a natural, dramatic and classic looks will all be catered for, too. If its designer collaborations are anything to go by, this venture is sure to be a success and we look forward to making our personal beauty and fashion statements in one fell high-street swoop. Posted on May 14, 2015, in #international, #retail. Bookmark the permalink. Leave a comment.